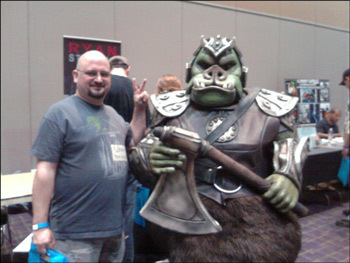 For years, I’ve been saying that I’m going to go one of the big comic conventions. I’d even picked out train routes and such for Chicago last year. But as usual, life happens, and I never made it. I’d considered it this year, but hadn’t seriously looked at dates schedule or got any of the requisite approvals from Mrs. Nerd. Flash forward to yesterday, the day of the event. I really wasn’t sure that I was going to go. To be honest, my thoughts were that I was more of toy collector and really wasn’t sure it would be my thing. We had some other things going on and a pretty busy day planned. Mrs. Nerd however convinced me that I would really regret it if I didn’t go. (She was right, of course.) To ensure I would go, she informed me that she was going with me. 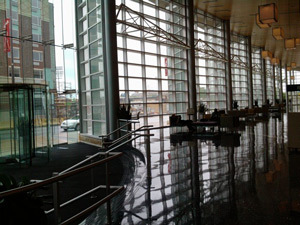 The event was held at the Grand Wayne Convention Center in Downtown Fort Wayne. Mrs. Nerd has organized a couple of events there in the past, so we were excited by that. Grand Wayne was refurbished a few years ago and is to me one of the nicer event venues I’ve been to. With all of the other work going on downtown, it’s only going to continue to get nicer to visit downtown. I must explain a little bit about Mrs. Nerd and me at this point. I’m a T-shirt and jeans kind of guy and she’s a penny loafers and cardigan kind of girl. For the first few years we were married, she worked hard to “degeek” me. Not in bad ways, but just in little ways that I knew she was right about. 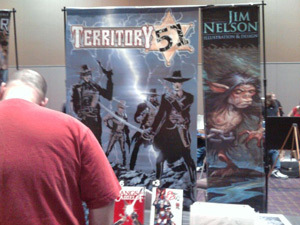 Before we even left the parking lot, we got exposed to a small amount of comic fandom. A couple had two children dressed as heroes, a boy dressed as Iron Fist and a girl dressed as Kitty Pride. Mrs. Nerd correctly pointed out the little girl was dressed as one of the X-men. Yes, my fellow nerds, she’s mine and you can’t have her. Once in the Convention Center, I checked the time on the panel I wanted to see and we entered the main area. While there were a few people in costumes, most of the random geekness was displayed on T-shirts. The guy with plumbers crack sitting in front of at the panel had on Iron Man underwear, but those were probably just his regular Underoos. For the Star Wars fans, there was a contingent of the 501st. I’ve got a lot of respect for the Star Wars fans that put these costumes together. I don’t have the time, patience or money to do it, but give props to the folks that do. I have to say that the Gamorean Guard was the best costume version of the porcine guard I’ve seen. I’m the one on the left, in case you’re wondering. I’m sporting my new Yoda as Oscar the Grouch T-shirt. The sign on it says, “Scram you will.” I have to say that I’ve never gotten so many compliments on any piece of clothing before, ever. Thanks, everyone. I’m not going to tell you about everything we saw yesterday. There just isn’t enough space here. I will say that the organizers did a great job of making this a show about artists. There wasn’t a lot of other fluff to distract from artists and their work. They’re the main reason shows like this exist, and should be the focus. Speaking of the artists, I cannot believe the shear amount of talent at this show. The styles were as varied as topics and ranged from the kitchy to dark. Mrs. Nerd and I were both incredibly impressed by all of them. While I won’t review everything today, there are artists that I want to go back and take a more in depth look at in the near future. Watch the site for more information coming soon! I do want to, however mention a couple of them here, because they were some of the highlights of the day. 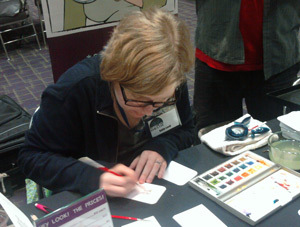 Shortly before we were heading into the panel on Webcomics, she talked about what she wanted with Luke for her sketch. He gave her a time to come back and we headed to the panel on webcomics. Because of our interest in the web, it was interesting to hear the panel talking about the things they do for promotion and the general workings of their comics. All of these artists are really small business people, with a product that is basically themselves. It was a different perspective from the normal web small biz people we’ve previously met, but, in general, they really they face the same problems every small business does. After the panel, we went back to see Traci’s finished piece of art. 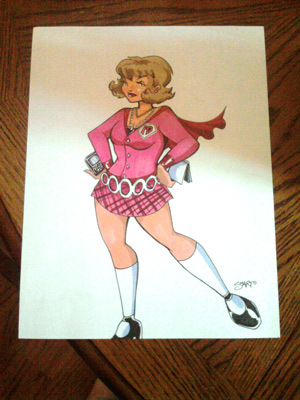 Yes, there is a little artistic license, but this piece really captures the essence of the Promo Diva®. Smartphone, Notepad, plaid and a cardigan. I know this will turn up on her site somewhere. Now if I can only get her to wear skirts that short, but I digress. Not to be outdone, I knew I had to get a sketch myself. The one artist that stuck out in my walk around was Katie Cook. 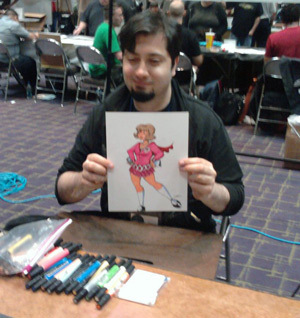 You might know her as one of the artists from the Star Wars: The Clone Wars web comic. You might also know her from some of her Star Wars trading cards. The thing that caught my attention was the Bunsen & Beaker piece in her book. The May 20th post on her blog shows this piece. I really liked all the Muppets in her book. They were all clean and comic book like, but still captured the essence of the characters. Now I know, you’re going to say how could you not ask a Star Wars artist not to do a Jedi sketch or something? Well, I just couldn’t. 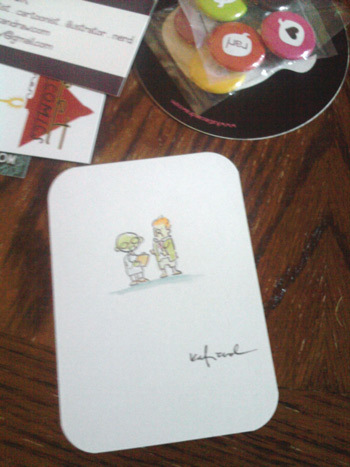 Katie was producing mini watercolor sketch cards and I couldn’t resist a mini Bunsen & Beaker. The engineer side of me won out. There was one suggestion for a change that came from Mrs. Nerd. I’ll see if you can spot it. We also got some small buttons at Katie’s booth. One of them says “nerd” and one says “Holy Crap”, which is one of Mrs. Nerd’s favorite sayings. If you see Katie in San Diego or at Celebration, stop and check out her work. It’ll be worth the time. And if she isn’t in the booth, talk to her husband. He’s a seriously funny guy who has a Jedi like ability to round paper corners. To sum up, we had a really great day. While Mrs. Nerd was slightly frightened by a couple of the geeks of the Captain Sweatpants variety, she really had a good time. I’m extremely grateful to have a wife that not only realized I need to go to this, but also enjoyed herself. On a side note, I forgot to mention the Bride and six bridesmaids entering the convention center as we were leaving. I had images of comic book people crashing the reception. Seems like a really fun event!. 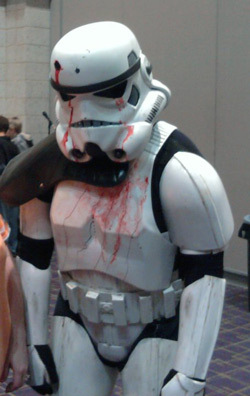 That bloody Stormtrooper looks really creepy. You a number of folks that saw the pictures have mentioned the Stormtrooper. I think (s)he was going for the look from the SW horror novel that recently came out.